We are looking forward to English translations of two programmes broadcast in Germany this month by ARD, the world’s largest public broadcaster. Links to the German programmes are given below. Sign up for alerts and we will let you know when English subtitles are available. The programme broadcast yesterday (28 September 2015) includes an interview with Syed Aamir Raza (the real salesman depicted in the forthcoming feature film Tigers) and Ines Fernandez from our partner organisation in the Philippines. 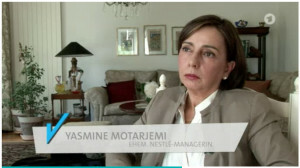 Nestlé’s former head of food safety, Yasmine Motarjemi, is interviewed in the first episode – she tried to persuade her superiors to act on food safety concerns and was sacked as she found the problems came from the top of the company. Also featured, Franklin Fredrick, who campaigns on Nestlé’s exploitation of community water supplies. As well as highlighting ethical concerns about Nestlé’s practices, the programmes placed volunteers in a “Nestlé Camp” to live on a diet of solely Nestlé products, while performing various tests. They found Nestlé products faired poorly in terms of price, taste and health. George Clooney comes under scrutiny for his pushing of Nespresso capsules. One programme breaks open capsules to see how much coffee they actually contain. The programmes are currently only available in German. They are about 45 minutes long. Sign up for alerts and we will let you know when English subtitles are available.